Buy Shining Gum Hedge online from UK hedging supplier of cell grown hedges and trees. 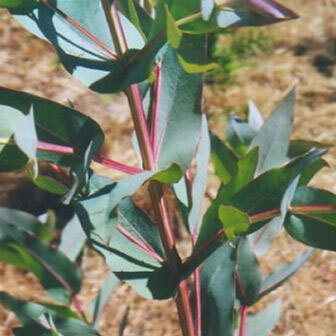 Eucalyptus Shining Gum is an evergreen, straight trunked, fast growing tree (up to 2m per year) which can grow to 60m, sometimes 90m in ideal conditions. Canopy is usually restricted to the top third of the tree. Plant in well drained sites however it will tolerate clay, chalk and acid soils. Even though our research has said it will survive many frosts down to minus 11 degrees centigrade, our suppliers say better to plant in sheltered positions. Therefore Shining Gum Eucalyptus is not covered by our free tree warranty for frost damage. 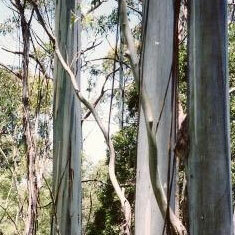 One unique feature to Shining Gum Eucalyptus is that the young growth has square stems to it. Now we know some of you will want to check this with an engineering set square accurate to within a squillionth of knats moustache hair so in the interests of preventing irate potential customers contacting us about the accuracy of our website, we shall say "it APPEARS square to NORMAL, AVERAGE human beings". It is native to Victoria and New South Wales Australia found in wet and cool forests. The bark is grey to grey/brown usually but can also be white to yellow in places and the bark sheds is long ribbons or strings. Some countries use it for furniture building, as the timber discolorations can be a striking feature. 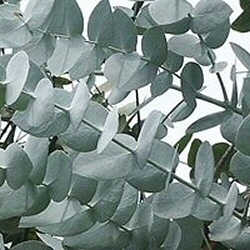 Eucalyptus oil extracted from the leaves has antiseptic properties so if you are prone to cuts and grazes and thinking of building your own furniture then start growing Eucalyptus Nitens. The leaves also have a pungent aroma to them when crushed. We were not sure in the office if you could have "pungent good" or "pungent bad" so technically we are just telling you that we found out the leaf aroma is pungent! Apparently the tree diameter can reach 1.8 metres in ideal conditions so probably not a container/patio tree or for 6ft wide gardens. The tree can be hard pruned without any major effects other than less of a tree obviously. 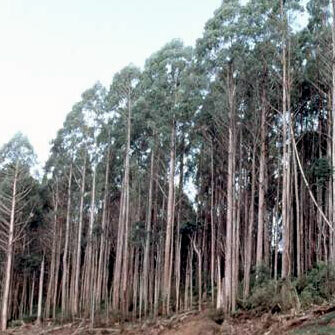 As with most Eucalyptus it has an exceptional growth rate and is a good choice for bio-fuel production. 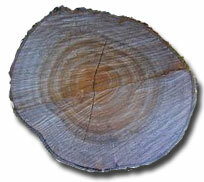 Timber production rates can achieve 30-35 cubic metres per hectare per year however this is under ideal conditions. 20-25 cubic metres per year is more likely however 50 cubic metres have been achieved on elevations in the 400-800 metre range in Europe. Many commercial plantations use it for paper/pulp production. For best short term results try not to disturb Shining Gum tree roots too much when planting. As our plug plants come with their rootball intact, this should be much easier for you to achieve. It is better to plant Shining Gum trees when they are very young e.g. before they are more than a few years old as the success rate is higher. Our Shining Gum Eucalyptus trees are sold as plug plants, in other words the roots are encased in compost. This means that planting can be carried out at any time of the year, provided they are watered in periods of drought, compared to bare-root plants which can only be planted during the plants normal dormant period (November to March). All of these trees are North UK grown, which is important for successful establishment.